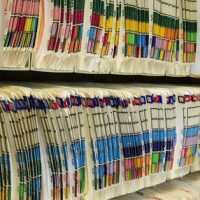 Should You Store or Dispose of Patient Records? When a business files for bankruptcy and dissolves, it needs to do something with its records. This is as true of health care businesses that have extensive patient records. But what should you do with them? Interestingly, the Bankruptcy Code in section 351 explains that a health care business may destroy patient records when they do not have enough money to pay for storage. However, this might not be your best option if you are going out of business. Let’s dive deeper into the requirements placed on health care providers. Unfortunately, Section 351 doesn’t allow business owners to immediately dump patient records into a trash can the day after filing for bankruptcy. Instead, it requires that you engage in an elaborate process of getting the patients to pick up the records and, if that fails, try to convince government agencies to store them. First, you must publish notice in one or more newspapers, tipping off patients that their records will be destroyed if not claimed in a year. Second, within six months of publishing the notice, the health care business must individually notify patients at their most recent address (or the address of a family member) to remind them to pick up their files within a year. You must also notify the patient’s insurer that they can pick up the records and notify the Attorney General of your state. Once a year has passed, business owners must write to appropriate federal agencies and ask them to take possession of the unclaimed records. For example, the Social Security Administration might hold onto records for patients that were on Medicare or Medicaid. However, most federal agencies will decline. Only after sending all these notifications can you then destroy the files by shredding or burning them. Records that are electronic can be destroyed in a professional manner also. You should probably hire a professional disposal company to destroy them for you. Certainly, don’t dump records in the trash, where someone could pick them out. Should You Even Destroy the Records? As you can see, the requirements are onerous. If you have thousands of patient records, you will need to go through and send an individual notice to every single person, as well as their insurer. This is not only time-consuming but could be incredibly costly. You might need to keep one or two employees full time just to send appropriate notices, and then you need to factor in mailing costs. There is another option: simply pay to have the records stored for the foreseeable future. The company will make digital copies of all records and allow patients to access them for a small fee. The company stays on top of federal and Florida law and destroys old records when appropriate. Unless you have a very small business with few patients, it is probably more cost-effective to store records. Make sure to get quotes from more than one records storing companies so that you can comparison shop. If you are looking to shut down a health care business, you need tailored advice about your responsibilities for winding down. At Nowack & Olson, our Plantation bankruptcy lawyers advise our clients so that they stay on the right side of the law. Contact us today. You can schedule a free consultation by calling 888-813-4737.